Be met our tour guide & driver at Tianjin (Xingang) Port at 9am. Drive to Mutianyu Great Wall. 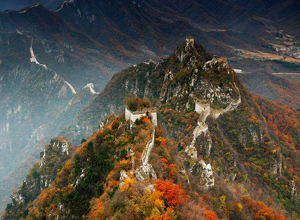 Mutianyu Section was first built in the mid-6th century and older than the Badaling section. The Mutianyu Great Wall has the largest construction scale and best quality among all sections of Great Wall. Transfer to hotel after the tour. Pick you up from hotel at early morning by our tour guide & driver. Then, visit Temple of Heaven, a masterpiece of the Chinese people created in ancient times. People do a lot of activities at Temple of Heaven especially in the morning, you can see many native dancing, doing Tai Chi and so on. Afterwards, we’ll visit Tiananmen Square which is the largest city center square in the world and has witnessed many important history events of China, then head for the nearby Forbidden City, the imperial palace for twenty-four emperors during the Ming and Qing dynasties. Return to hotel after the tour. Our tour guide & driver will pick you up from the hotel in the morning. Then we are going to visit Summer Palace which was constructed in 1750 by Qianlong in Qing Dynasty and rebuilt by Emperor Guangxu and is the best preserved imperial garden in the world. After that, take the Hutong tour with Rickshaw. It is one of the symbols of Beijing, everyone who visit Beijing wants to feel the unique culture of Hutong. After lunch, we will transfer you back to Tianjin Port safely before 4pm. The Forbidden City is closed on Mondays. If your Forbidden City tour happens on Monday, we will switch the itinerary and move it to be on Day 1. Why choose a Beijing Group Tour from Tianjin (Xingang) Port? 1. Our group tours are self- organized by our tour company rather than other agencies, that is, you won’t join in a group with tourists from several other tour operators. 2. Share a guide and driver but their special treatment makes you feel like part of a friendly family. 3. Nice experience to meet people from all over the world and share your feeling about trip. Of course, if you book your own hotel we will deduct the hotel fee for you and will transfer you to your hotel everyday. Can I make any change about the tour itinerary? All of our group tours enjoy the best price, the tour itinerary is fixed, NOT changeable. Any changes, will make your group tour bacome a customized private tour. You are not able to enjoy the group tour quotation anymore. You can see 3 Days Beijing Private Tour from Tianjin Port at: https://www.tianjinporttours.com/tinajin-cruise-port-tours-by-days/3-day-beijing-tour-from-port/. Will the compulsive shopping arranged in your tour? No, this is a No-shopping tour. Our company is legal registered with the authorities. Our company official name is: Beijing Explore Tours CO., LTD and our tour lisence number is: L-BJ01577. Can I get refund if I am not satisfied with your service? Yes, during your tour if any unsatisfied with your tour guide, hotel, vehicle, driver or restaurant please inform us. We will change for you accordingly, if still not up to your standard, we will refund your money. If you want to cancel the tour or your cruise ship has any changes, you just need to inform us 24 hours before the scheduled pick-up time. Then we will refund you in full. Celebrity Millenium will be docked from 3-5 April 2019, we were looking at doing the 3 day group tour, could you please advise if we would have any free time for shopping etc on our own. According to our tour itinerary, we will transfer you to hotel before 17:00 on day 1 & 2. So if you choose the hotel at Wangfujing Shopping Street, you will have plenty of time to do shopping. We are interested in 3 Day Group Tour without Hotel and would like to book Four Seasons Beijing on our own. Is this OK? and what is rate with hotel per person (2 people). Yes, you can book Four Seasons Beijing on your own. The tour price without hotel is USD232 per person. Pick up and drop off at down town hotel can be arrange?if yes, the price will be the same as USD 328 for 4star hotel. USD328 per person is based on use 4-star Beijing Sunworld Hotel, which is at the best location Wangfujing Street. If you would like to use another hotel, please book the hotel room on your own. We can drop you off and pick you up from your hotel. The tour price without hotel is USD232 per person. Thank you for reply. I’m prefer joining the package tour with hotel. My husband and I will be arrive Tianjin at 2100 hrs. We will stay at Tianjin down town hotel and join your tour. Wangfujing Shopping Street if we book our own? Are there washroom on the tour bus? and when is the best time to book? thanks! The tour without hotel is USD238 per person. If you book your own hotel, Wangfujing area is the best, at least should be at downtown area. There isn’t washroom on the tour bus, but we will have a washroom stop on the way from port to the city. April is the busy season if you can book the early the better. No worries. If want to cancel the tour, deposit will be refunded if we are informed 24 hours before the scheduled pick-up time. Can you arrange Pekinge duck reservation for evening, or for a good show. If you need Peking duck dinner and night show, our guide will help you when you in Beijing. Please does your return to port time 16.00 (04.00 pm) comply to the Celebrity Millennium Cruise requirements as the vessels leaves a 18.00 (06.00 pm)on the 29 March 2018. Only gives a 2 hour window. We will transfer you back to Tianjin port before 4pm on Mar. 29, 2018. Please do not worry! We have sent you an email, please check it out. Where we meet you in Tianjin cruise port (Millenium)? Our tour guide will wait for you at port exit. We have sent you an email, have you received it? My husband and I will arrive in Tianjin Port on 28th March 2017 on Celebrity Millennium. We are interested in the Beijing 3 day group tour. Is breakfast included in the Sunwold hotel package? Are lunches each day included? Could you please email me a detailed list of all inclusions? Yes, Breakfast is included in the hotel packages. And lunches are included each day. We just sent you an email, please check it out. We will arrive with the Celebrity Millennium in Tianjin on the 20th March 2017. We would like to do the 3 Day trip to Beijing in your offer on basis of a 4 or 5 star hotel. We know the price for the group tour is around 350USD. How much is the price for the private 3 day tour? I saw on your website Port A and Port B; what is the difference. Alltough we are from Belgium, do you have also guided tours in German? From what moment on we can reserve for this period (March 2017)? Can we reserve the same trip in the offshore excursions office on board of the Celebrity Millennium.? Having old parents what happens if we have to cancel the cruise? 1) USD348 is the group tour quotation with 5 star hotel. If you want private tour quotation please let me know how many people would take the tour? And the private tour would be definitely much more expensive than the group tour. 2) The difference between Port A and Port B is the attractions. They have different attractions listed in the itinerary. 3) Our group tour guide will be an English speaking guide. The German speaking guide can be only arranged for private tour. 4) You can book the tour right now, since there are already tourists have booked the group tour. And they are from your same cruise. 6) If you want to cancel the tour, please let us know at least 24 hours before you arrive Tianjin. We can cancel the tour for you and refund you tour deposit free of charge. Sorry I meant to add, as we are from England could we pay in sterling, & if so what would be the price of the 3 day 4 star hotel & tour be? Thank you for your message. The tour balance can be paid in Cash to our guide in CNY or USD (but not GBP). Our guide can help you to exchange money at your hotel reception or bank if it is necessary. We have sent an email to you, please check. Hi there, can we pay the remainder of money in USD? or does it have to be CNY. We to are on the millenium on the 21st of April 2015. ps ( we require the 3 day tour @ 284 USD per person ) look forward to your reply. Kind Regards Marie. What will happen if the number of participants in the tour will be small? Thank you for your message. We have had more than 20 passengers booked this tour from Celebrity Millennium on Apr. 21-23, 2015 so far, and we can arrange the tour no matter how many passengers. Please do not worry. Hi, I am interested in this 3 days Beijing Group Tour pick up from Tianjin Cruise port. our Celebrity cruise will be docked at 6am on April 21-23 and leave at 6pm in the evening. would we be able to come back in time before the cruiseship takes off? Can you give me the breakdown of what is inclued in this package. Thank you for your message. We will transfer you back to Tianjin port before 5pm on Apr. 23, 2015. We just sent an email to you, please check. Hello, I can’t find your website reviews on trip advisor. Is there a link for that? Thank you for your message. Please see our customers’ feedbacks on Trip Advisor at http://www.tripadvisor.com/ShowTopic-g294212-i2147-k7357510-Beijing_TourS_guide-Beijing.html. There are some clients from Celebrity Millennium Cruise have booked our 2 days and 3 days Beijing group tours from Tianjin Port. To book the tour, half tour fee as deposit is required according to our policy. PayPal is the most convenient way to make the payment. If you agree, we will send you a PayPal link for you to pay the deposit. By following that payment link, you will be transferred to Paypal’s secure online payment website. If you have a Paypal account, all you need to do is to log in to your account and click the pay button. If you don’t have a Paypal account, you can still pay us at Paypal’s website by providing your credit card information. Paypal accepts all major credit cards and debit cards. The balance you can pay in CNY cash to our tour guide when you in Beijing.